When a mum brought in her 4 month old twins, Melvin John and Cheryl Gift they were both presenting with a high fever of 39.6, they weren’t feeding and they were failing to thrive. Fortunately their one year old sister wasn’t displaying the same symptoms. Mum was very concerned that they had Malaria and after checking their blood in the clinic lab it was confirmed that they had a high count of Falciparum Malaria. This type of Malaria is frequently known as Cerebral Malaria and is the most deadly form of Malaria causing over half a million deaths a year, mostly in Sub-Saharan Africa. Babies born in this part of Kenya are at particularly high risk as this area is close to Lake Victoria and known as the Lake Endemic zone. Every effort is made to ensure mums with young babies are provided with insecticide treated nets but bringing up babies in absolute poverty means that the surrounding infra structure is so poor that mosquitoes are very hard to eradicate. The only answer to complete eradication of Malaria is to tackle the poverty that is intrinsically linked with the disease. 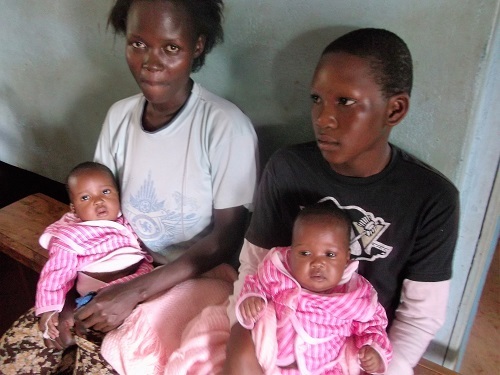 Luckily the life saving work of the Buburi Community Health Clinic means that both twins were successfully treated with Malaria medication and we know that this literally saved their lives. All babies born into this community will regularly pick up Malaria infections, it is almost impossible for them not to. If they are lucky enough to be able to access the Buburi Clinic they will receive life saving medication. During their young lives, with repeated infections, they will gradually build up resilience to the disease that will help them fight future infections later in life. However many babies are not this fortunate and will die from these infections. We hope the Buburi Clinic will ensure that more and more children survive this danger and go on to live fulfilling lives.